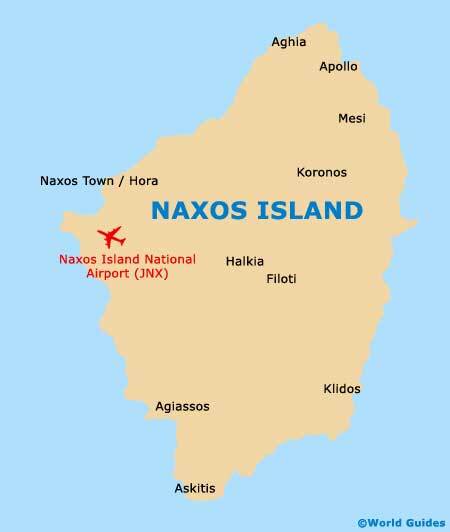 In operation since 1992, the tiny Naxos Island National Airport offers domestic flights to Athens only, with no international or charter flights being available here. It is situated 3 km / 2 miles from Naxos Town (Hora) and is the main transport hub of the island. Olympic Air is the only airline serving the airport, providing daily flights between Athens. Buses and taxis operate at the airport, offering quick transfers into the capital. While there are no car rental operators onsite as such, car hire can be easily arranged through suppliers based in Naxos Town. Rental cars allow easy exploration of the island, many areas of which are somewhat untouched by tourism. Worth noting, the best time to visit the island is generally considered to be between the months of July and August, when rainfall is at its lowest and temperatures are at their warmest. The closest beach to the Naxos Island National Airport is Abram Beach, which is 12 km / 7 miles away, while the second closest is Apollonas, at 18 km / 11 miles away. Car rental is the best way to access these beaches, although public buses and taxis are on hand as well. This is also a popular air gateway to the other Cyclades islands, since few have their own airport. Naxos receives less tourism than many other Greek islands, making it an ideal place for those who want to relax, explore and get away from it all. Car hire is the best way to do this. Since car rental is not available directly at the airport, many visitors use the car rental services in Naxos Town itself. The Andrea Papandreou takes drivers to the capital in just ten minutes. Book your Naxos Car Rental here. Public buses connect the facility with Naxos Town in around 15 minutes. From the city, onward bus connections to Melanes, Halki, Apollonas, Apiranthos and Pyrgaki are readily available, although services are often infrequent. Many hotels offer airport transfers via minibus, and so guests should book this service in advance. Taxis, available at the airport, are the most popular way to reach the capital of Naxos. They can be picked up outside Arrivals or pre-booked in advance. Taxis here typically operate according to fixed rates.